Right now, to beat the competition, you have no other alternative but to spy on your competitors and their move. Tracking their content, search ranking, emails, social mention and more can help in boosting your business. There are multiple SEO tools, which will help to monitor not just your website performance but that of your competitors’ as well. The best thing that people are unsure of is that they are already using some of those tools in their daily marketing practices. For awesome competitive intelligence, you have to start using these SEO competitor analysis tools to help grow your business. In this post, we share the 8 best competitor analysis tools to check out right now. 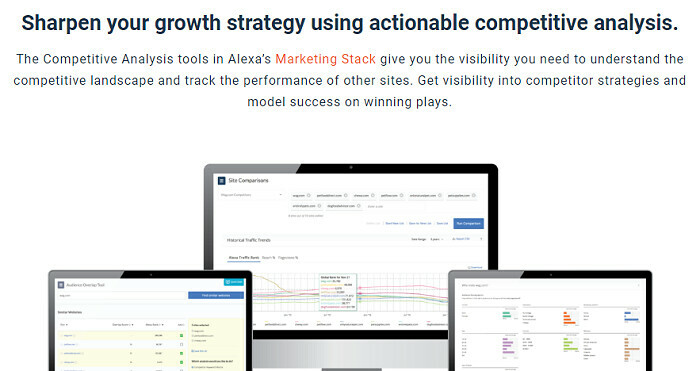 Alexa is one of the best SEO Competitor Analysis tools, which will allow tracking globalized web traffic of your own website and that of your competitors. Information is definitely the power and Alexa is one such must-have tool for that. You can use the tool for transforming data into competitive value for the business. If you are using the Moz toolbar, that will show you the Alexa website ranking. It helps you to spy on competitors’ backlinks, keywords, and traffic. With the help of this tool, you get to compare various websites within your niche and get international competitors and website ranks for a complete picture. InfiniGraph is a tool designed to track trends in social media based circles. It helps in combining consumer to brands by addressing interactions in real time. It further uses targeting to find out what contents and brands are popular now. With the help of social intelligence, you can pay attention to powerful influencers and content for that successful campaign. This tool will help in tracking social media trends of competitors within your niche. It helps to provide insights into the target audience. InfiniGraph is not quite used for social listening. Another interesting competitor analysis tool is SE Ranking and even experts from Tayloright.com might suggest you use it. This tool, as understood from the name itself, will help monitor search rankings of the competitors on any target region or engine. It can work on maximum five projects on each website. You will end up getting details reports on main competitors. This data will include information on the average position, website visibility, and traffic forecast. You even get the chance to gather data for the first page of a tracked query and ordered them by running through visibility. This tool is used for presenting brief information on top 10 online sites for each query presented. If you are planning to track anything in details, add that to “main competitors” tab and track for some extra details. Monitor Backlinks is the next tool which is a must for SEO based competitor analysis. It is relatively new to the market but already gained quite some reputation. You will be able to track multiple competitors’ backlinks and even disclose a bunch of negative ones. You will also get to find some quality ones. This tool is relatively designed to help analyze backlinks of webmasters and bloggers in your field for building own link based building strategy. It further helps in building quality links from competitors and writes some link bait content. You can further estimate traffic increase, depending on keyword positioning. It will use the effort to boost good backlinks to a certain website. Through this tool, you can always check out some new links from competitors, and start analyzing bad and good links. You will further receive an overall SEO snapshot and can compare the results. This tool is perfect for building a new marketing strategy. SpyFu is is one of the best competitor analysis tools which helps users to view all data on competitors’ keywords in AdWords and organic search. It helps in providing you with related keywords. You have to add competitors’ keywords and get the overall view of strategy. You can easily procure a list of keywords targeted or used by competitors in AdWords or organic search. It is rather a good tool for researching new keywords, business niche, and plan tests. As a pro tip, always remember to view destination URL for the ads to see how the competition is actually analyzing landing pages. Open Site Explorer is one of the easiest and well-known competitor analysis tools for monitoring backlinks. It will not just help you to follow competitors’ backlinks but will use data for improving link building strategies. You will come to learn so much more. You will learn about data on the page and even domain authority. People will further get to know about anchor text, compare links for up to 5 websites and even link domains. You need to check out what links the competitors are using and compare those link profiles with yours. It helps in boosting the current link building strategies. iSpionage is another competitor Analysis tool, which will make it easier to check on the organic search of your competitors. This package comprises a set of tools, which include social monitoring, SEO competitive research, and even keyword tracking. This tool is designed to help you enter competitors and check their best PPC and organic keywords. You will know how much they are spending on this tool and their effective ad copy. Moat is described as a multifunctional tool covering the advertising industry. With the help of this tool, you will find out more about the ads that are running on top brands and different websites. You get the chance to view sizes and places of recently displayed advertisement. Moat further provides a guide on where you can place your ads for better ranking and human traffic. You enter the band name of competitors that you are planning to spy on and get the overall report of display ads they are running on. These are very few of the vast range of SEO tools available to analyze your competitors in the market nowadays. Just try to go through each one of them, check their features and then respond. Are you using any competitor analysis tools? Feel free to share your thoughts and feedback through comments.